Heavy rain last Friday failed to dampen the spirits of six private schools that competed in their annual netball tournament. 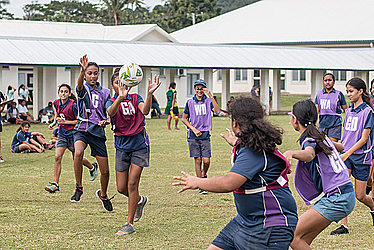 Girls from Pesega Middle School, Robert Louis Stevenson School, Peace Chapel, Ah Mu Academy, Samoa Primary School, and Vaiala Beach School played their hearts out at the Pesega fields. There were four divisions from Years 5-8. The tournament aimed to develop the skillset of the game of netball at the grassroots level. The tournament was organized by the schools in collaboration with Netball Samoa. Netball Samoa also provided prizes and certificates for the kids along with officials and umpires for the tournament. During the prize giving ceremony, the players had the pleasure of meeting Netball New Zealand ambassador and current Silver Fern, Grace Kara (Nee Rasmussen). “I am honoured to be here to share my experiences and knowledge of the game with the netball community in Samoa,” Grace said. Grace is currently in Samoa to promote the NetGo programme and conduct netball clinics. NetGo Samoa is a Pacific sporting partnership between Netball New Zealand and Netball Samoa. It is an initiative that looks to make a significant and positive impact through the promoting of healthy lifestyle messages and encourages children to play netball and stay active.